The minimum wage hasn’t kept pace with inflation, according to three Democratic U.S. Congressmen. They want to correct the situation by boosting the federal standard to $10 an hour. 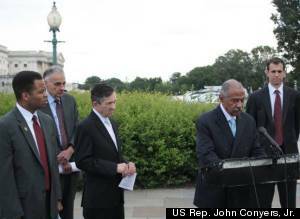 Reps. John Conyers, Jr. (D-Mich.), Jesse Jackson, Jr. (D-Ill.) and Dennis Kucinich (D-Ohio) announced the introduction of The “Catching Up To 1968 Act of 2012” at a press conference in Washington, D.C., Wednesday. The proposed bill would bump the minimum wage up from $7.25 an hour and require an annual increase tied to inflation. The congressmen said that even at $10 an hour, the minimum wage would still be below 1968 levels when adjusted for inflation. Congress hasn’t passed legislation raising the minimum wage since 2006, when it put in place a series of increases that ended in 2009. Consumer advocate and former presidential candidate Ralph Nader helped announce the legislation at the Wednesday press conference. Two thirds of the American public — including a majority of Republicans — supported raising the minimum wage in a October 2010 poll by the Public Religion Research Institute. While running for office, President Barack Obama promised to raise the minimum wage to $9.50 an hour by 2011. Both the president and his 2012 campaign opponent Republican Mitt Romney have supported the idea of adjusting the minimum wage to keep up with inflation. UPDATE: 3:00 p.m. — State Senator Bert Johnson (D-Highland Park), who is running against Conyers for the newly redrawn 13th U.S. congressional district, introduced his own minimum wage hike for the state of Michigan on Thursday. His bill would raise the state’s minimum wage to $10 an hour by 2015 and would link it to the rate of inflation as measured by the United States Department of Labor. Michigan’s current minimum wage is $7.25 an hour. Johnson’s proposed legislation would raise the rate to $7.90 by Jan. 1st, 2013 and gradually raise it to $10 an hour by Jan. 1st, 2015. “It is time the Republican majority does something to benefit the people of Michigan, as opposed to raising citizens’ taxes, eliminating tax credits for working families and slashing services in order to give taxpayer-funded handouts to their corporate benefactors,” Johnson said in a release.